I remember @Darkspire17 telling me on Discord back in February that the RT movie is pretty much dead (he got the info from a Sony contact) and that it was because HG was hard to work with. Yet at the RT panel at WonderCon they acted like the damn thing was still in production. I don't quite hate it, but if I were in charge, I would give it a tone like PSX Doom and Doom 64 while making it more like the Doom Bible. Also, I'm noticing many jumping to the conclusion "THIS IS ABSOLUTE crap" despite the fact that this is merely a 30 second teaser that barely shows that much of the film. Based on this, it seems that Jetfire's chest can swap faction symbols. Either that or it's a set of stickers like with CW Megs, but I'm leaning more toward the former. This thing looks absolutely hideous. I'm at least hoping the Matchbox/Playmates one goes down in value on eBay when it comes out, unless they manage to make it worse than that. Are these custom-made? Where can I get them? 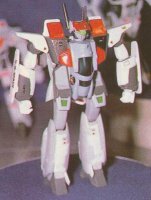 That said, one thing I think might make this more worth it is if they do one of the YF-1R, but that's highly unlikely given how they never acknowledge Battlecry's existence anymore. Pretty funny how the 1A is just a generic brownie yet it's labeled as Ben's/Kakizaki's. I'm sorry, but why are they doing these again? At least do the Legioss/Alpha Morphers too.